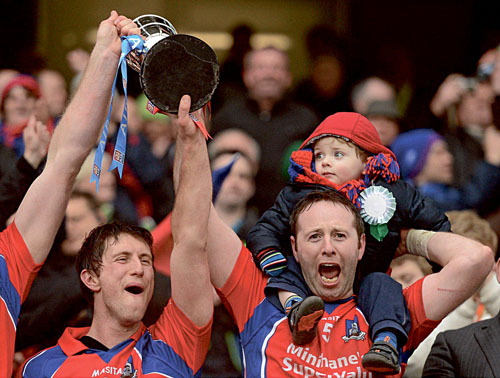 A proud moment: Enda Tannion, with two-year-old son Matthew, celebrates St Thomas’ victory in the All Ireland Senior Club Hurling Championship final with clubmate Kenneth Burke in Croke Park on St Patrick’s Day. Any club team that wins an All-Ireland senior title has a few leaders who come to the fore when their team's need is greatest. Last Sunday when the Tommy Moore cup was there to be won for St Thomas at Croke Park in the second half, Richard Murray hit two crucial points to show direction and calm from the forward division. For his 1-2 from play he was rightly awarded the TG4 man-of-the-match. However not far behind him for leadership, calmness personified, and doing the right thing in possession was 34-years-old wing back and self-professed “Daddy of the team”, Enda Tannion. He produced a storming second-half performance, his clearances were top class, and he hurled a lot of ball from wing-back in the last 20 minutes. Tannion describes last weekend and the entire hurling year for the club as a pure “fairy tale”. "It is real Roy of the Rovers Stuff,” he says. “A small club like ours, with only slightly more than 200 houses in the whole place, is not really meant to be winning senior club All-Irelands. We are thrilled to be All-Ireland champions and we are going to enjoy it for a week or two now." Tannion, a self-employed electrician, has been donning an adult jersey for St Thomas for almost 20 years and he knows how hard many people have worked for many decades for last Sunday to become a reality. “I’ve seen the bad days as well as the good days, and this success means an awful lot to everyone involved. When I first started, the club was senior back in 1995. We got relegated to intermediate the same year. We came back up the following year and went back down again in 97. We struggled a bit then, and came back up in 2004. Our objective then was just to win a game and stay senior. Ever since then we’ve been making steady progress with the odd set-back." Possibly the lowest point was in 2008 when they were beaten out the gate by Turloughmore in Athenry. “We were beaten by about 25 points and it was like You’ve Been Framed. You were just waiting for someone to come out and say it was a joke. So to be back now as All-Ireland champions is an amazing turnaround." One of the highlights of Tannion's week was heading to Croke Park last Sunday morning on the bus. The whole area was awash with blue and red and he remembers seeing a sign that really struck him and left him awash with emotion. The sign read “Courage, Honour and Respect”. And those three words struck a chord. "When I read that sign, heading off to Croke Park last Sunday, I got a bit emotional to be honest. Those three words sum up the journey to success for us and St Thomas really. Courage, to follow our dreams; Honour - for our friends and family; and Respect - for the jersey and the club we represent. "There have been many fine men and women before us and people will come after us, and all we can do is do our best for the time we have the jersey on our backs. It is only on loan to us really and all we can do is to be the best we can be, while we have it." Tannion is also delighted that all the St Thomas panel spent a few hours last Tuesday down in the two National schools of Kilchreest and Peterswell. "We have to try to make sure the next generation of young hurlers is given every chance to dream of wearing the club colours too. We are only a small club and we all have to try to put our bit back into keeping things going. The All-Ireland success will help, but we have to be constantly working at keeping our standards high. That is what has got us to where we are this week and we won't forget it."